The original Raspberry Pi 40-pin (T-Shaped) breakout board and ribbon cable by CanaKit! 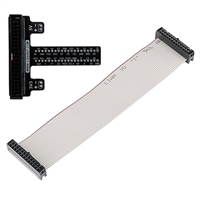 The CanaKit GPIO breakout board allows for an easy connection from the Raspberry Pi to a breadboard in order for you to create fun electronic projects with your Raspberry Pi. The board comes fully assembled and no soldering is required. Note: Raspberry Pi board, breadboard, jumper wires and other components are not included.